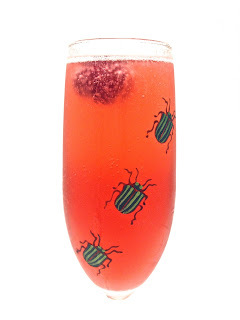 This first cocktail is a nice alternative to the classic Buck's Fizz and has a gorgeously, festive hue that makes it perfect for a Christmas Day tipple. Muddle (squish) the raspberries in the bottom of your cocktail shaker, along with the Creme de Pêche de Vigne. Add the gin, a little ice and give it a quick shake just to cool the liquid. Double strain the cocktail into a chilled glass and then transfer to a chilled champagne flute. This will avoid spilling the cocktail down the side of the glass if your champagne flutes are narrow at the top. Carefully top up with fizz, avoiding overspill and then briefly stir with a swizzle stick to mix the drink. This next cocktail is a very delicate shade of green with an equally delicate flavour. 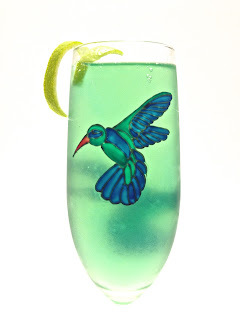 The trick is not to overdo the Blue Curaçao, thus lending the drink a hint of orange and a beautiful sea green shade. Add the Gin, Blue Curaçao and lime to a large mixing glass, with ice and stir briefly to mix the liquids. Strain the mixture into a chilled champagne flute and top with fizz. Twist the strip of lime zest over the cocktail to release the citrus aroma and garnish the drink. Now tequila may not be a drink you immediately associate with Christmas or with Champagne for that matter, but dispel those preconceptions and open your mind and your tastebuds to this delicious concoction that combines these two elements in a surprisingly light and pleasant quaff. The easiest way to remove the grapes from their skins is to cut them in half and then hold the halved grape between your forefinger and thumb and pinch them together. The grape should just pop out. If not you can remove any little bits of skin by double straining the drink at the end. Muddle (squish) the grapes with the tequila in the bottom of a shaker. Add the Chase Elderflower Liqueur, a little ice and shake briefly to chill the liquids. Double strain the cocktail into a chilled champagne flute and pop in the sliced grape. Top up with chilled Champagne or Cava. 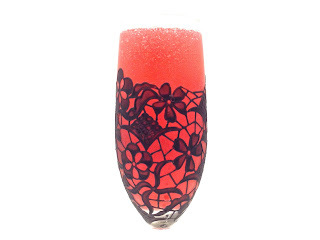 This final cocktail uses just a taste of Creme de Violette to give a floral note without straying into parma violet territory. The combination of Absolut Raspberri vodka and fresh raspberries keep the flavour fresh and light and a couple of dashes of simple syrup are all this needs to sweeten it. Muddle (squish) the raspberries with the vodka and add everything else except the garnish in the bottom of the shaker. Add a handful of ice and shake to cool the liquids. Double strain the cocktail into a chilled champagne glass and pop a raspberry in the bottom of the flute. Top up very slowly with Champagne or Cava to avoid the cocktail fizzing over. Gently stir with a swizzle stick. 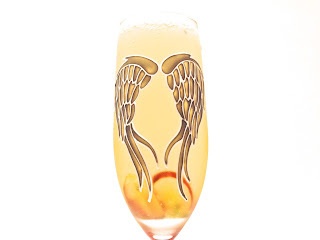 I hope that you have a wonderful holiday season and remember; a Champagne cocktail is not just for Christmas…. Absinthe is a curiously mouth numbing concoction that derives it's colour and flavour from the botanicals that it's distilled with; the most notable being 'wormwood' or 'artemisia absinthium', to give it, it's Latin name. Wormwood, apart from sounding like a character from Tolkien, is also credited with giving absinthe it's mind altering capabilities due to the presence of Thujone, a ketone that was erroneously thought to act on the brain in much the same way as THCs in cannabis. However, this turns out not to be the case as in fact, Thujone is most likely to cause muscle spams and convulsions - yikes! But you needn't worry, because the levels of Thujone are so minuscule that you would have long since died from alcohol poisoning before you could possibly consume enough Absinthe for the Thujone to kick in. The most likely explanation for the accounts of it's hallucinogenic properties are down to a combination of things - mainly, it's high alcohol content (it's distilled at anywhere between 45%-75% ABV) and perhaps the copper stills that it was originally made in. 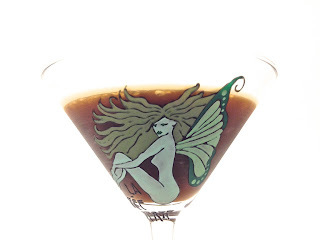 Poor maintenance, lax standards and highly unregulated production could have resulted in contaminated Absinthe that may have led to sightings of green fairies and goodness knows what else. Sadly, Absinthe's reputation is largely unfounded, but it is certainly a drink to be reckoned with. The history of Absinthe dates backs to the 1790's when French Doctor, Pierre Ordinaire absolved himself of his inauspicious monicker and created his 'cure all' tonic by distilling the bitter leaves of the wormwood plant with other herbs, local to his home in Switzerland, such as anise, lemon balm and hyssop. Rumour had it that he obtained the recipe from a pair of sisters who had been making this tonic for years, but whatever the truth, it remained the medicine of choice for the jolly Swiss locals until it hit the big time in 1797 when the Pernod brothers opened their distillery in Couvet, Switzerland and began production on an international scale. Distilleries opened all over France and the success of the Pernod brothers encouraged less conscientious producers to get themselves a cut of the action, resulting in unadulterated and frankly dangerous 'Absinthe'. In the 1840's, Absinthe was used by the French army in North Africa, ostensibly as a water purifier (one assumes the bacteria were too inebriated to be bothered causing dysentery) and as a malarial preventative (again, rendering the mosquitos incapable of action...). Upon returning home, the soldiers brought with them a taste for the green stuff and it's popularity spread with such intensity across France, that the time between 5 and 7 in the evening when bourgeoisie hit the cafés for a post work beverage became known as 'l'heure verte' (The Green Hour'. From then on, Absinthe became very much associated with bohemian Paris and it's artists and poets such as Lautrec and Baudelaire which all helped to fuel it's seditious reputation. Several years of reduced wine production in France due to weather conditions meant that Absinthe began to outsell it's vine grown rival and the country's annual consumption grew to a mind boggling 21 million litres, which made it's subsequent ban all the more shocking... So what went wrong? How did the French fall so badly out of love with Absinthe? Well, no doubt it was due in part to pressure from the very rich and powerful wine producers who were unable to compete with low price of Absinthe and put added pressure on the government to find fault with the drink. Lurid tales of licentiousness and crime caused by drinking Absinthe, abounded and were much played upon by the press. The presence of Thujone which was considered a dangerous neurotoxin was grossly exaggerated and there was growing popularity for the Temperance movement across the whole of Europe which called for the ban of all types of alcohol. The final nail in the coffin for Absinthe was a terrible murder case in which the main protagonist had murdered his entire family whilst bombed out of his brain on vast amounts of alcohol. Much was made of the Absinthe he had consumed, although it was but a drop in the ocean of all the types of alcohol that had passed his lips before he raised the gun to his family. Nonetheless, a scapegoat was required and the whole debacle was labelled the Absinthe Murder by the gutter press. A nationwide ban ensued and many other countries took up the cause, although not Britain as we were probably too drunk on cheap gin to care. Around the 1990s the myth and legend of Absinthe began to re-emerge and brave, young hedonists set forth on a quest to get annihilated on Absinthe in the hope of seeing 'La Fée Verte', but sadly, most were only to discover Le Green Sick and Le Big Headache. Finally in 2002 the ban was lifted and production began in France once more and by 2007, even the US were allowing Absinthe back on their shores. The traditional way to drink Absinthe is to place a sugar cube atop a slotted spoon, above a glass of Absinthe and drip cold filtered water through the sugar until it reaches the desired sweetness and dilution. There is a pleasing element to the rigmarole of this old fashioned routine, but it is of course, entirely unnecessary; a dash of simple syrup and a little water would produce the same results, but where's the fun in that? 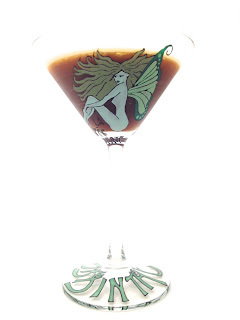 As for Absinthe cocktails, well, the list is extensive; the Savoy Cocktail Book lists 108 cocktails containing Absinthe, the majority of which, use the spirit in minimal amounts. This is because the overriding flavour of anise and aforementioned mouth numbing property tend to destroy all other flavours in it's path. 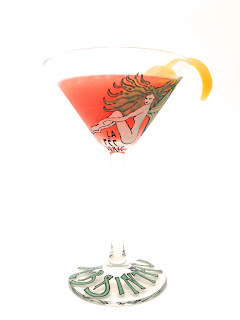 Many other absinthe cocktails from the book sound like the deranged and dangerous concoctions of a hormonal teenager left in possession of their parent's cocktail cabinet, containing nothing but hard liquor with an ice cube chucked in. (Note to any rooky Absinthe pilferers; do not attempt to top up the bottle with water to cover your tracks - also applies to Pernod and Ouzo as I discovered when I was 13) However, there are a few drinks that I would like to share, that you will hopefully enjoy whether or not you are already a fan of Absinthe. The first is a classic cocktail with a name that has quite a history… The Monkey Gland cocktail was apparently named in reference to the experiments of much ridiculed and frankly, bonkers scientist, Serge Voronoff who, in the 1920's believed he could enhance male libido by grafting the tissue of monkey testicles onto human ones. The cocktail, one presumes, was supposed to do much the same job, although my findings, unfortunately, do not bear this out. Neither Mr TG or myself were overcome with lust after sharing a Monkey Gland, but we did agree that it was a pleasant enough drink with perhaps, just a hint of Benylin Cough Mixture to it. Add everything except for the garnish, to a cocktail shaker with ice. Shake hard, until the outside of the shaker begins to frost. Twist the strip of zest over the drink to release the orange aroma and garnish. 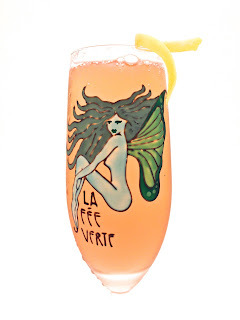 Next up is a variation on a variation of a classic, the Corpse Reviver No. 2. The esteemed cocktail writer, Harry Craddock wrote that the Corpse Reviver should be imbibed 'before 11am or whenever steam and energy are needed'. The original hair of the dog cocktail, the Corpse Reviver No. 1 is a fairly unremarkable drink, but the No.2 is really rather wonderful. It's primarily a gin cocktail, but the smallest dash of absinthe gives it a depth and complexity that would otherwise be lacking. My variation was down to a lack of Lilet Blanc, a fortified wine that tends to be grouped with vermouth, but has a flavour all of it's own. In it's absence, I used a sweet vermouth, which, while different to the original, is still a great drink. 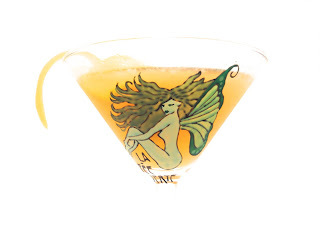 Add the Absinthe to a chilled martini glass and 'rinse' the glass- i.e. swill the Absinthe around to coat the inside of the glass and discard the excess (if any). Add everything except the garnish to a shaker with ice and shake hard until the outside frosts over. 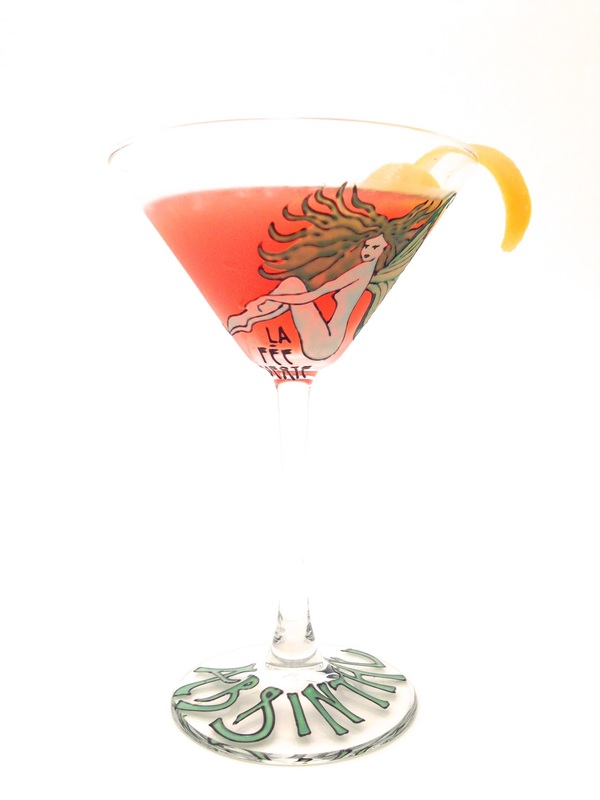 Twist the strip of lemon zest above the drink to release the citrus aroma and garnish. Moving away from the classics, this next cocktail is one of my own creation. 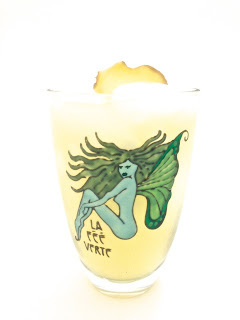 It combines the heat of ginger and smoke of tequila with green tea, lime and a hint of absinthe. The flavour is complex, earthy and warming with the heat of the ginger, blending with the spirits to tame their flavours. Prepare the green tea ahead of time and allow to cool. The best green tea is made from loose leaf, infused for about 5 minutes using water that has cooled slightly from boiling point. Add the spirits and fresh grated ginger to a shaker and muddle (squish) to really release the fieriness of the ginger. Add the rest of the ingredients, apart from the garnish, with a handful of ice and shake hard until the outside of the shaker becomes frosty. Double strain the cocktail into a tumbler filled with ice, to ensure the fibrous ginger is left behind and pop in the slice of fresh ginger. As the name suggests, this next cocktail has a real kick, provided in the main from the chilli infused Campari, details of which you can find here - Chilli Infused Campari. Add to that, triple sec, a little Absinthe and Champagne and you've got yourself quite the little pick me up! Add everything apart from the Champagne to a shaker with a little ice and give a quick shake, just to chill the contents. There's no messing around with this final cocktail - it contains a full shot of Absinthe and it's flavour is pure anise. What I like about this is the way it combines with the coffee and syrup to taste like liquorice for grown ups. However, if liquorice isn't your thing or you were planning on using your taste buds for anything else within an hour of drinking it, then it's probably not for you. Add everything to a shaker filled with ice and shake hard until the outside becomes frosted and then shake some more. Strain the cocktail into a chilled martini glass. Just for the record, the Absinthe used in all these cocktails was Nemesinthe and the Gin was actually Aldi own brand, Oliver Cromwell Gin. I had read in the Guardian that it had received various awards, following blind tastings and felt obliged to try it. I can confirm that it's not bad at all and at around £13 for a litre, it's worth getting a bottle to stock up your cocktail bar.